its been a month since ive posted my last post.. fell kinda ackward typing.. huhu.. so, this post is going to be a 4-in-1 post.. hehe..
Allah had granted nina another year filled with success, happiness, sadness.. Alhamdulilah.. the post is entitled 50 hours of joy, im really gonna remember my 20th birthday celebration forever..! thank you family and dearie friends..! it was the FIRST TIME in nina's life that she had to celebrate her bday without her family...! it was memorable..! then, we went to wanira to have our dinner... ive to bring the cake without the box to the restaurant.. haih.. it was raining that night... haih... thanks to nadzirah..! people were watching me.. (is it normal for people to carry a cake without the box in a rainy day to a restaurant?-i guess not!).. haih.. got the chance to slice the cake.. the cake was too big for the 4 of us to eat.. we gave some to the cook, a big slice to a guy sitting next to our table (that guy has a crush on fara! *wink*).... it was the short-but-best bday celebration in my life..! was soo happy..! thanks guys...! got soo many presents that night..!! weeee... was soo happy.. i love getting presents..! thanks korang..! after arrived home, its time to open up the presents...! got a set of perfume n lotion from angah.. a novel and a notebook from fara n a lovely purple hijab from nadz..! thanks...! loved them all..! the best part is, my room is filled with balloons...! (though im not such a balloon-lover type of person..!).... its just made my day perfect..! the best part is, ive received a special call form uk..! i was my dear bro...! cool.. thanks abang..! love u cam orang gilak..! i slept late that night...! my frens send lots n lots of birthay wishes... made me smile even more....~ sleep with a smile on my face... im thankful ive got great frens around me... thanks korang.. to those who remembered my birthday, inni uhibbu kifillah- i love you because of Allah... to those who didn't, i love you because of Allah.. love my frens whoever n wherever they are... im blessed..! the next day, mom cooked nasi ayam for nina... mom's nasi ayam sgt2 la sedap...! people can get addicted to her cooking..! heaven~... nina's aunts, uncles, cousins, nieces, nephews came from morning till night... wah.. another calebration for nina..! guess what??! nina's wish came true..! haha.. nina prayed that the next day after nina's bday would be nina's bday again..! hahaha... yeap.. Allah granted nina's wish... had another bday celebration on 25th.. heaven.. shared my bday wif frens n family... im the luckiest girl that day..! 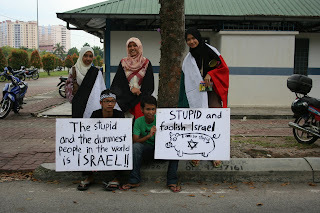 the whole world was shocked to hear that israel launched the attack to palestin.. curse those israelian people...! my cousins in palestin were killed every second..! no worries dear cousins... you may had suffered in this world but now its time for you to rest in peace with Allah's love.. dear friends, let us boycott israeli laknatullah goods.. for every cent we invest to all those israeli goods, we are helping them to buy another rocket that is going to kill our brothers n sisters in Palestin..! please people.. remember our cousins first before you start spending your money..! don't be so selfish n only think of yourselves.... start thinking about other people...! you may not have the courage like the palestinians to go and kill people, what you can do is boycott israeli goods..! 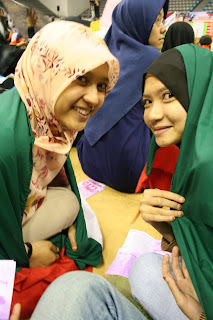 went to shah alam wif nadz, bha, papa, mama, eman n zana... rapat umum... soo many many people were there.. was thrilled..! people was so semangat..! 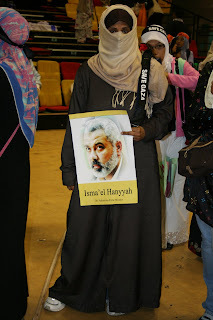 they came with banners, papers, mafla... anything they can bring along to ekspress their support to the palestinians.. the speakers were superb..! can feel their spirit..! 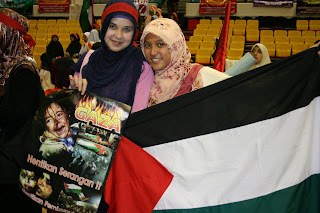 seeing the people around me screaming 'Allahu Akbar' made me feel so anxious to help my brothers n sisters in Palestin..! somehow the aura absorbs into my blood and bones..!! met lots of people there.. nadz's frens especially.. good people.. mek was shy at first, but towards the end she was the one who were soo excited to shout Allahu Akbar..! 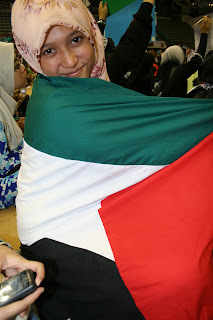 huhu..
Let us pray for the freedom of Palestin.. freedom of al-quds.. and the disaster of Israel..! Allahu Akbar..! went to balai cerap al-khawarizmi in tanjung bidara... had a great time.. good place to relax the mind after having a hectic week studying and meetings..! went there to see the partial solar eclipse..! was so excited.. first time to see eclipse closely... went there wif the ppi pals.. got a suprise there.. kak nash was there to join us...!! yay..! seeing the eclipse made me feel so humble with Allah's creation.. i watched the egg 'stood up straight' during the eclipse... its like magic..! i saw Allah's power in front of my two eyes.. subhanallah... it happened because of the powerful gravity force from the moon, sun n the earth itself.. it was fantastic.! i don't need people to pity me.. i feel lucky Allah loves me soo much that he grant me this pain... to think about it, i think the pain i faced is 0.0000000001% of what the Palestinian are facing right now... so, nina, be strong..! please make all the pain nina felt as kafarah..
please make nina's skin as beautiful as baby's soft skin when nina meet You..